I think I may have a problem when wiring my track. 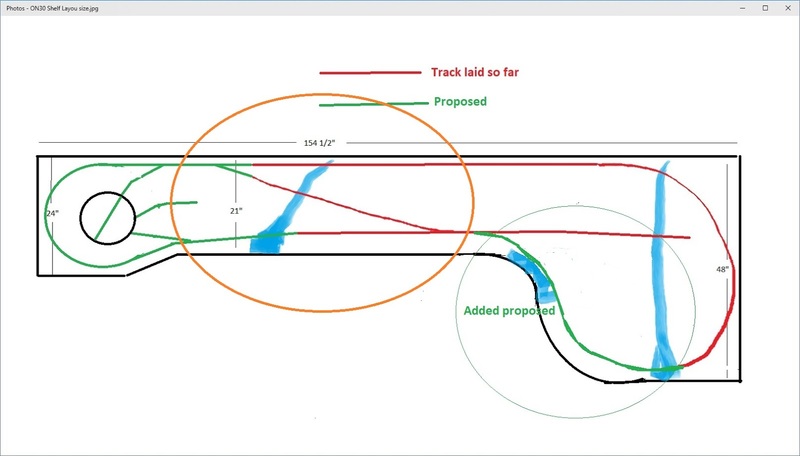 I have a part of the track that crosses over from one side of the total loop to the other. Highlighted in the orange circle. Wiring the circle red to the inside track black to the outside. The crossover track would effectively switch this polarity. Or do I not wire this track and let the switches deal with it? without hitting the 'reverse' button, needs an "auto-reverser". outside rails (closest to the table edge) are connected to one buss wire and the inside rails to the other. The turntable will need an auto-reverser too. James is right. If you go with an AR1 by Digitrax; http://www.digitrax.com/products/autoreversing/ar1/ that will switch your polarity automatically. As far as your turntable goes, if you have an Atlas type turntable with a split ring, it does not need an auto reverser. A lot of turntables to not have this feature, and need the auto reverser installed. The AR-1 comes with a Tunable Trip Current (TTC). In most cases it never needs adjustment, the AR1 works just fine without any adjustment at all. Perfect and thanks for the hookup diagram. Luckily all my trains will be short.